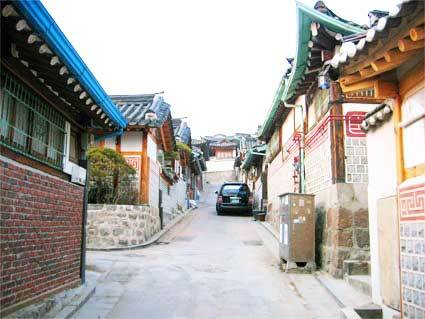 The narrow streets of Bukchon were planned long before automobiles became an integral part of modern life. Indeed, some streets are no wider than an average car. In developing the Bukchon Plan, the authors envisaged the creation of parking zones for residents and visitors - inevitably these would not be some distance from many people's homes or destinations. The plan aimed to free the narrow streets of vehicles so that visitors could enjoy the views and amble about in peace. Perhaps this was an impossible goal! While it true that some residential parking zones have been established, it is equally true that the narrow streets are as blockaded by cars and commercial vehicles before. Parking regulations are not enforced and consequently ignored. If you find your front door blockaded by a vehicle, just hope the owner has left a note with his mobile phone number or that you have sufficient food supplies to last until the car is moved. Is this not the same as before? No, it is worse. The families that used to live in Kahoi-Dong formed a community where problems were shared, and so people took care to avoid the enormous inconveniences careless parking can cause. Now it has become a ghost town of "second homes" and speculative real estate investments, it has also become a parking lot.